Our sandalwood patchouli soap smells of sandalwood with just a touch of patchouli, we also add just enough ground apricot seeds for a light exfoliation. This bar is very popular with men and women alike and makes a special gift for that exotic hippie in your life. 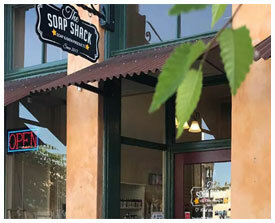 We handcraft our soap bars in small batches right in our store using skin loving ingredients. We designed our soap to have a nice lather but wash off clean leavng your skin soft and refreshed. Distilled water, rice bran oil, olive oil, coconut oil, shea butter, cocoa butter, fragrance, mica, apricot seeds.